Our God, our Creator, our Sustainer, and our Maintainer, who possesses Love, Compassion, and Forgiveness, bring peace to your people by showing us how to love each other. Do not lay on us a burden greater than our capacity to bear. Open our hearts and minds, so that all humanity strives to develop the attributes that you ingrained in us when you made us in your image. Teach us how to care for each other in times of pain, suffering, and illness. Give us the courage to embrace all the citizens of the world, and help us to reconcile with people of all colours, races, and religious identities. Let patience, perseverance, and prayer be our means of reaching your highest ideals. Our Lord, forgive all those who have erred intentionally or unintentionally. Give us the wisdom and compassion to undo the damage that we have done to our fellow human beings and to our mother earth that sustains all humanity. Create in us a sense of family – of sisterhood and brotherhood with those people whom we have never met nor known. Let not the unknown to us be the cause of any distrust or injustice to anyone. Create in our bonds of genuine friendship, where we can uphold each other’s rights and stand up for justice, even if we are to be witnesses against ourselves, against our children, and against our parents. Let not nationalism of one nation be the cause of injustice to any nation. Give us the courage to stand up for righteousness with the people who are rich and powerful and who possess compassionate and loving hearts to work for the poor, the destitute, the hungry, and the homeless of not only this country but of any country in any part of this world. Give us family values and a sense of responsibility to fight the crimes and drug abuse that are harming our youths and neighbourhoods. Give spiritual guidance and blessings to global rulers and legislators. 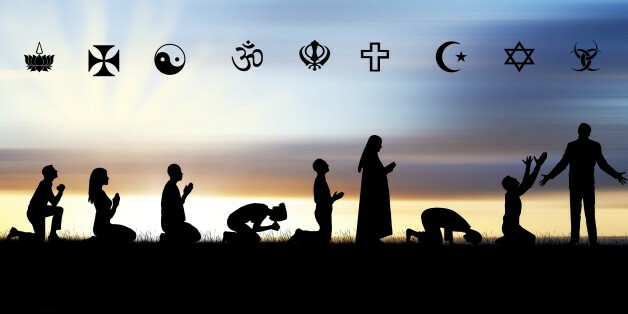 Bless this country and its people who live as Christians, Jews, Muslims, Hindus, Buddhists, and people of other faiths and no faiths. Our Lord, show us how to work for the common good of all humanity and give us the wisdom to maintain peace and tranquillity for the people of this great nation. Let every homeless person in each city find a home and a safe place to eat and sleep in our blessed nation, the United States of America. Amen. Allah(swt) you are Peace, through you flows Peace. Give all of us Peace not only in this life but also in the hereafter. Amen. United Muslims of America Interfaith Alliance, SSF, CA. 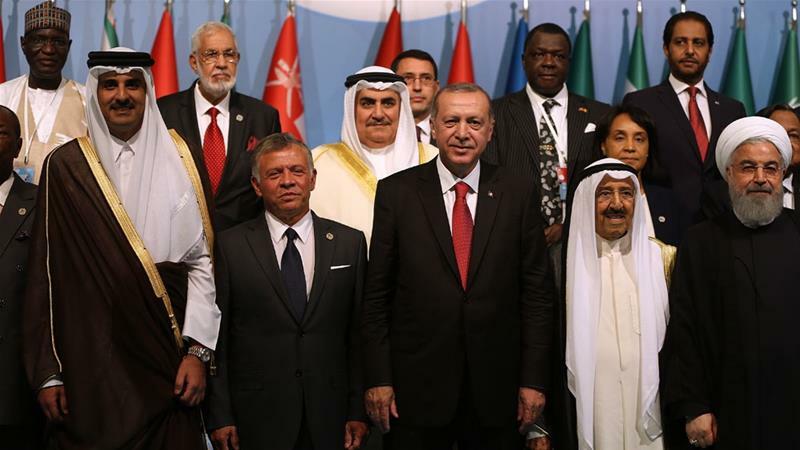 Turkish President Recep Tayyip Erdogan has called on Muslim leaders to unite and confront Israel, days after scores of Palestinians were killed by Israeli snipers as they marked 70 years of Israeli occupation. The protesters in the besieged enclave had gathered to commemorate Nakba Day – an event in 1948 when Zionist paramilitaries ethnically cleansed Palestinian cities and towns. About 750,000 people were forcibly expelled from historical Palestine. Speaking at the conference, Qatar’s Emir Sheikh Tamim bin Hamad Al Thani said the Palestinian cause had “become a symbol for oppressed peoples everywhere” and condemned Israel for “brutal massacre” of peaceful demonstrators. “Who among us does not know the declared siege forced on Gaza Strip and collective punishment against its population?” the emir said. “The Gaza Strip has been transformed into a large concentration camp for millions of people who are deprived of their most basic rights to travel, education, work and medical treatment. For his part, Palestinian Prime Minister Rami Hamdallah said the US had become “part of the problem and not the solution” and called the relocation of the embassy “an act of aggression against the Islamic nation, against Muslims and Christians”. Jordanian King Abdullah II urged for the adoption of urgent measures to back “the resistance of Palestinians”, while Iranian President Hasan Rouhani called for economic and political measures against the US and Israel. Late on Friday, the OIC issued a final communique calling on the United Nations to form an international investigation into the killings in Gaza; the creation of an international protection force for Palestinians, and for the OIC to place economic restrictions on any countries, companies or individuals who recognise Israel’s annexation of Jerusalem. Earlier in the day, Erdogan told a raucous crowd of more than 10,000 people in Istanbul’s Yenikapi fairground that the Muslim world had to unite and “pull themselves back together”. “Muslims are way too busy fighting and disagreeing with themselves, and shy away when confronted by their enemies,” he told the audience. Earlier this week, Turkey recalled its envoys to Israel and the US following the killings of the Palestinians and the relocation of Washington’s embassy from Jerusalem to Tel Aviv. Tolgar Memis, a German-Turk, said he came to the rally to support Erdogan’s recent remarks and policies against Israel. “What we’ve seen over the last few years, all the injustice, and what happened earlier this week – it’s simply unacceptable. ALERT TO MUSLIMS: Far-right Israelis vow to change status quo at Jerusalem holy sites – Middle East Eye. JERUSALEM – Where days before thousands of Palestinians had prayed in the streets around Jerusalem’s Old City in protests aimed at “defending” Al-Aqsa, last night Israeli flags flew and Israel’s deputy defence minister gave a speech calling for Israel to impose its “full authority” on the Temple Mount so that the temple could be rebuilt. Police closed off the march’s route to Palestinians as around 300 people paraded through East Jerusalem. The march, organised annually for the past 23 years by Women in Green, a settler organisation, takes place on the eve of the Jewish Tisha B’Av festival, when Jews mourn the ancient destruction of the two temples. “This year the march has special significance because for the last weeks we have unfortunately undergone such humiliation by the enemy,” Nadia Matar, co-chair of Women in Green, told Middle East Eye. “The entire saga of those metal detectors was a horrendous feeling of victory for the enemy against our own government and we are very disappointed,” she said. The depth of hurt and anger that Israel’s religious right feels after the events of the last few weeks were on full display. “This year we got a reminder, after the terrible things that happened with the Arabs, that not everything yet is ours… and all of a sudden we understood how important it is to walk here,” Matar later told the marchers. The Israeli government installed metal detectors at the entrance to Jerusalem’s most sensitive religious site after three Palestinian citizens of Israel shot and killed two Israeli police officers on 14 July at the site. The move was seen as a violation of the status quo by the city’s Palestinians, and two weeks of street protests followed. The metal detectors were removed on 27 July. A Channel 2 poll broadcast on 25 July showed that 77 percent of Israelis characterised the removal of the metal detectors as a “surrender”. It was a view echoed in a speech given by Likud politician Yehuda Glick, a prominent temple advocate, who called on the government to stand by the “values of the people”. “It’s not only enough to have sovereignty on paper, we demand from our government to implement its sovereignty and to show who’s boss,” Matar said. Attendees at the march that Middle East Eye spoke to did not have any sympathy for the Palestinian refusal to accept the metal detectors. 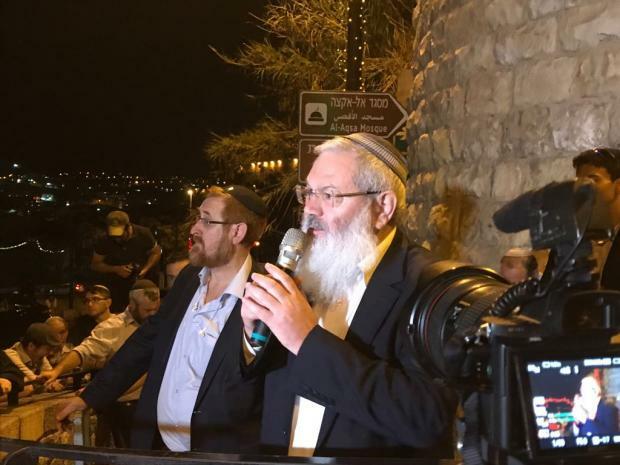 “The metal detectors were just an excuse for unrest, the Palestinians should have walked through them like I do when I go to the Kotel,” said Yechiel Goldstein, referring to the Western Wall. When asked if the violence that had ensued made him nervous about what could happen if the “status quo” at the Temple Mount/Haram al-Sharif compound was changed, he said the status quo was to blame. The status quo is the delicate agreement that has governed the religious site since Ottoman times, but firmed up after Israel captured East Jerusalem from Jordan in 1967. While Israel retains control over access to the site, the site itself is under the control of the Waqf, a Jordanian religious trust. Palestinian fears that Israel is attempting to change the status quo at the site have driven previous outbreaks of violence, such as riots in 2014, and the unrest that spiralled into a round of widespread attacks on Israelis in 2015. The Second Intifada started in 2000 when then opposition leader Ariel Sharon visited the site. These fears have grown worse recently against the background of rising popularity of temple activism amongst some Jews. Traditional orthodoxy held that Jews were forbidden from visiting the Temple Mount, but increasing numbers have ascended in recent years. On Tuesday morning alone, 1,042 Jews visited the Temple Mount/Haram al-Sharif compound, a single-day record, according to the Jerusalem Post. Another visiting period will be take place this afternoon. Numbers have increased from 14,000 visitors in the last Hebrew year, to more than 17,500 this year, with six weeks still remaining, according to the Jerusalem Post. So, while the crisis at Jerusalem’s most sensitive site looks over for now, the dynamics that produced it are still in place, and growing in magnitude. The speakers at the march last night were certainly not backing down. On October 11, 1999, a democratically elected government of PML-N was toppled by the military under Gen Pervez Musharraf. Nawaz Sharif (NS) was jailed and awarded life sentence on charges of hijacking and terrorism. Saudi Arabia came to his rescue and he was exiled for ten years. Benazir Bhutto (BB) was already in self-imposed exile. The Supreme Court legitimized military rule and authorized Musharraf to amend the constitution to his liking. With two mainstream leaders in exile, it became easy for Musharraf to carve out a King’s Party comprising turncoats from PML-N and PPP by applying coercive and blackmailing tactics. Pakistan came under the black star after 9/11 when Musharraf agreed to become a coalition partner of US-NATO, render assistance to topple friendly Taliban regime in Afghanistan, and to help in installing the US selected Northern Alliance regime led by Hamid Karzai, which became anti-Pakistan and pro-India. Pakistan also agreed to become a frontline State to fight US imposed war on terror. Musharraf and his team didn’t realize that Afghanistan had been occupied by the USA under a preplanned strategy to destabilize the region and achieve its geostrategic and geo-economic objectives and that Pakistan was not an ally but a target. Since then, Afghanistan is being bled by the occupying forces and the collaborators and Pakistan bled through proxies and drones. Pakistan has been striving hard to combat the existential threat of terrorism, achieve political stability, and improve its economy and to sail towards the shores of safety, security, progress, and prosperity. Terrorism couldn’t be eliminated since the ones demanding the elimination of terrorism secretly support terror groups in Pakistan and seek destabilization of Pakistan to achieve their hidden objectives. The socio-politico-economic situation became abysmal during the five years rule of the PPP under Zardari. The coalition of PPP-MQM-ANP installed by USA-UK in March 2008 with an ulterior motive reduced the country to a carcass. The rot was stymied when NS led PML-N government took over power in June 2013. Improvement of internal security and the economy as a result of dedicated operations in Karachi, FATA and Baluchistan, better financial management and forthcoming CPEC couldn’t be digested by adversaries of Pakistan since it hampered their agenda of disabling Pakistan’s nuclear program. Likewise, development driven agenda didn’t suit the politicians in opposition. A well-orchestrated hate campaign was unleashed by politicians, lobbies, media and social media against NS within one year of his rule to discredit him. Vilification campaign and demand for accountability should have been logically directed against massive wrongdoings of Zardari and company and anti-Pakistan MQM under Altaf working on RAW-MI-6 agenda, the effects of which are still being borne by the people of Pakistan. Instead, the tirade has remained focused on ruling PML-N regime which has lifted all economic indicators from negative to positive, stabilized macro economy and restored the health of the sick economy to some degree. It has pulled out the country from the worst energy crisis and hopefully by March 2018 it would overcome power shortages. The lawless regions of FATA, parts of Khyber Pakhtunkhwa (KP), Baluchistan and Karachi have been made stable and peaceful and the genie of terrorism controlled to quite an extent. Large numbers of mega development projects are in progress and foreign investment that had dried up is flowing in. Socio-economic deprivations of smaller provinces are likely to be addressed by the game-changing CPEC. Pakistan’s image that had sunk low has risen among the world comity and it has again become relevant. While the ruling government has made substantial progress in the last 4 years, however, a lot is still to be done. Pakistan is still not out of the woods since internal and external security situation is tense, debt burden and trade deficit have increased and exports have dwindled. One reason that Pakistan has not overcome its multiple difficulties is the negative role of detractors within Pakistan that have constantly been creating hurdles in the way of progress and development. Secondly, PPP-led Sindh government is not serious in carrying out reforms and controlling corruption which is bleeding Karachi, the economic lifeline of Pakistan. Thirdly, RAW, NDS, CIA, Mossad, MI-6 nexus based in Afghanistan continues to abet terrorism in Pakistan and induce political instability. Turning a deaf ear to the impressive progress made, power hungry and disgruntled politicians assisted by media downplay the positives by finding faults in development projects and drum beat the weak areas. They are leaving no stone unturned to disparage the image of NS and block the progress through negative tactics. This phenomenon of vilification campaign and impeding growth and development is not new. Awami League led by Sheikh Mujibur Rahman and PPP under ZA Bhutto disturbed law and order situation by resorting to street agitation to overturn the stupendous all-round developments made by Ayub Khan during his 10-years rule. Economically and militarily strong Pakistan was unacceptable to the adversaries of Pakistan. After forcing Ayub Khan to resign, the duo deliberately created a political logjam for politically naïve Gen Yahya Khan. By tearing up Polish resolution at the UN, Bhutto made sure that the armed forces suffered immense humiliation at the hands of archrival India. Mujib and Bhutto were instrumental in the breakup of Pakistan into two in 1971. All this was done at the behest of foreign powers to cut Pakistan and its armed forces to size. While Sheikh Mujib had galvanized Bengali nationalism by blaming West Pakistan for the backwardness of East Pakistan and had promised the moon to the Bengalis, Bhutto cast a spell of magic on the downtrodden people of West Pakistan by chanting the slogan of Roti, Kapra, Makan. Both brought people on the streets to paralyze and derail the system. Both lacked sincerity of purpose and their sole ambition was to gain power. While Mujib wanted the whole cake, Bhutto wanted half of it. Lust for power overrode national interests. ZA Bhutto during his 7 years rule became a dictator. To curb political dissent, he created FSF and opened Dalai camp to torture his opponents. He washed away the gains made by Ayub Khan through his highly anomalous policy of nationalization which gave a deathly blow to the burgeoning industry of Pakistan, banking, and education. Indiscipline was inculcated by Bhutto by inciting the labor and working class to rebel against their employers. He misled the masses by blaming 22 rich families for keeping Pakistan backward. He ignored the hard fact that Indian leaders had predicted that Pakistan would collapse within six months under the weight of economics. Pakistan developed its economic legs to stand on because of the financial assets brought by these very industrialists who had opted to shift to Pakistan. Ironically, since the early 1990s, successive governments in Pakistan have been begging foreign investors and offering lucrative terms to induce them to invest in Pakistan, build industries, buy lands and install thermal power projects. Bhutto intensified New-Sindhi and Old-Sindhi antagonism in Sindh by introducing quota system and making the Sindhi language a compulsory subject in Sindh. He incensed Baloch and Pashtuns after he sacked provincial governments in Baluchistan and Frontier provinces and mounted an operation against the Baloch rebels. He supported Islamists in Afghanistan to counter the belligerence of Sardar Daud thereby stoking religious extremism and Jihadism in Pakistan which later on accelerated during the 10-year Afghan war and uprising in Indian Occupied Kashmir (IOK). Bhutto promoted secularism which triggered religious extremism, deepened Islamic-secular divide and gave birth to PNA movement and led to his ouster. While Bhutto started the Kahuta project to develop a nuclear bomb, uranium enriched nuclear program could not have seen the light of the day had Afghan war not taken place. Gen Ziaul Haq took full advantage of it and pursued it relentlessly and carried out cold tests in 1984. Fear of bomb in the basement kept India at bay. Zia crushed the PPP-led MRD movement in 1983 with dangerous connotations, since it had the full support of India. He had to deal with foreign supported Al-Zulfiqar movement together with KGB-RAW-KHAD nexus involved in terrorism. Pakistan under Zia single-handedly managed the Afghan war and emerged victoriously. Zia had made up his mind to make Pakistan a truly Islamic State in the light of Quran and Sunnah and had envisioned a clear strategy how to go about playing up the Khalistan movement and Kashmiri freedom movement and taking the two movements to their logical ends. Had Zia lived longer, Afghanistan could have saved itself from the bloody civil war and would have remained ever obliged to Pakistan. Prejudiced PPP and seculars, however, portray him as the worst dictator and blame him for loading Pakistan with all the misfortunes. The PPP under Benazir Bhutto (BB) symbolized poor governance, immorality, and corruption, thanks to her husband Zardari who became Mr. 10% in her first tenure and Mr. 20% in 2nd tenure. Both the civil and military establishments viewed BB as a security risk owing to her extraordinary softness towards her Oxford buddy Rajiv Gandhi and her commitment given to the USA that she would roll back the nuclear program. But for the provision of the list of Sikh leaders to India, Khalistan could have become a reality and IOK might have achieved independence since the Khalistan and Kashmir movements had almost linked up and Afghan Mujahideen under Gulbadin Hikmatyar had promised physical help. Thermal power has driven IPP agreement signed by BB in her second tenure amounted to giving control of electricity to foreign powers. It paved the way for the energy crisis. As opposed to two shortened PPP regimes led by BB, two short-lived PML-N regimes under NS were comparatively better which saw some development works including motorway and above all Pakistan becoming the 7th nuclear power. PPP under Zardari scaled new heights of corruption, nepotism, and ineptness. An abortive attempt was made to civilianize the ISI. The ill-omened Kerry-Lugar Bill opened the doors for NGOs, Blackwater and CIA agents which triggered urban terrorism. Helicopters assault in Abbottabad to get Osama bin Laden was aimed at tarnishing the image of Army and ISI. Hussain Haqqani at the behest of Zardari signed the Memo to virtually give Pakistan on contract to the USA. Gen Ashfaq Kayani and Lt Gen Shuja Pasha blocked the ominous effort and regained 17 administrative units in the northwest under the influence of RAW-NDS-CIA controlled TTP. PPP and MQM looted and plundered national wealth with both hands and sucked the blood of Karachi which generates over 60% of Pakistan’s revenue. Corruption-ridden ANP derailed the railway and did nothing for KP. While Karachi became lawless, a separatist movement in Baluchistan gained considerable strength. All State Corporations were systematically destroyed and Pakistan’s external debt doubled. Pakistan got caught up in worst energy crisis because of which industries began to close down and many industrialists shifted to other countries. The country was brought to the brink of economic collapse and yet the PPP government was allowed to complete five years. PTI under Imran Khan (IK) gained political space in 2011 as a result of misdoings of PPP and MQM, but instead of training its guns on the PPP and MQM, it locked horns with PML-N in Punjab since it knew that power resided in Punjab and nowhere else. The only silver lining in those dark days was the Shahbaz Sharif-led government in Punjab which kept things going despite highly unfavorable environments. Indefatigable Shahbaz’s outstanding performance paved the way for PML-N’s impressive victory in May 2013 elections. IK never reconciled with 2013 election results and for reasons best known to him imagined that he deserved to win. He married up with dubious Tahirul Qadri led PAT and single seater Sheikh Rashid to drumbeat the issue of rigging. They discounted the fact that PPP and not PML-N was in power that had made the transitional government to hold elections and that PTI had no roots in rural Pakistan. IK chose to emulate politics of agitation and defiance of Mujib and Bhutto to achieve his political ends. Following in their footsteps, he chanted the catchy slogan of ‘change’ and ‘Naya (new) Pakistan’. Like Bhutto, he too promotes liberalism and is germinating seeds of indiscipline among the youth. Previously his slogan was ‘justice’ and now his slogan is ‘corruption’. IK has all along pursued politics of defiance and agitation to undermine the State and its institutions and freely indulges in mudslinging and unsubstantiated accusations to defame NS and his family. After failing to oust NS by staging a 126-day sit-in in Islamabad in 2014, and then trying to lock down Islamabad in October 2016, IK is now pinning hopes on Panama Papers case handled by Supreme Court Bench. He refuses to admit that name of NS is not included in the list of account holders in Fonseca Mossack Offshore Company, and that PML-N government will remain in power until next elections even if NS is sacked or he resigns. While giving long sermons on the ills of corruption, IK completely skips the fact that cupboards of most of his party leaders are filled with skeletons. He is oblivious of the enormous moral degeneration of the society as a whole. Moral turpitude of the nation has hit rock bottom and corruption is one small part of it which has permeated into the blood of all segments of the society. The ones accepting graft and the others doling out graft are equally guilty. IK has no plan for moral refurbishment of the society or how to eliminate corruption. How will the corrupt be taken to task in the absence of effective accountability bill which is lying pending since 2010? If IK is so concerned about the eradication of corruption, why has he not agitated inside and outside the parliament to pass the accountability bill and make National Accountability Bureau (NAB) more effective and independent? If he strongly feels that all elections including the 2013 elections were rigged, has he made any effort to reform electoral laws to prevent rigging in future? Without comprehensive electoral reforms, same lot of immoral politicians will get elected and keep shifting from one green pasture to the other to derive maximum material benefits. Likewise, he has not pressurized the government to reform the criminal justice system and functioning of lower courts. Unless the judicial system is reformed, justice will remain confined to the elite class only and the ones involved in white collar crimes and mega corruption will never be netted. Similarly, crime and corruption cannot be tackled unless the police are depoliticized and investigative/prosecution systems streamlined. PTI is a collection of turncoats from other parties. Each and every defector in his party has a blemished track record. How IK expects to make New Pakistan with such opportunists who have brought him under their sway? When he couldn’t convert KP into a role model province, how can he change the destiny of whole of Pakistan with a King’s Party, particularly when he has no political standing in Baluchistan and Sindh? PTI, PPP and other political parties in opposition are ganging up to derail the political system by creating chaos and hampering growth and development. This is being done at a time when Pakistan is at an economic takeoff stage as a result of better governance and financial management and commissioning of CPEC. At the same time, it is up against external enemies and local detractors that are trying to sabotage progress. CPEC is an eyesore for India, USA, Iran, and Dubai. Upset by the achievements made by Pakistan, the adversaries that had been collectively trying to destabilize, de-Islamize, denuclearize and balkanize Pakistan since 2002 have intensified their efforts to block the development programs. The only option they are left with is to topple the ruling regime and foment political bedlam. This task has been undertaken by PTI and PPP. The Kingdom of Saudi Arabia (KSA) led the Gulf States have still not forgotten and forgiven the slight inflicted by Pakistan when its request for military support to tackle the threat posed by the Huthis in Yemen last year was impolitely turned down. The government had whittled under pressure of PTI and PPP. The fissures that were contracted with a lot of efforts are once again being widened by Iran inspired lobbies in Pakistan. Led by PTI, these lobbies in concert with media are applying pressure on the government to detach Pakistan from the 41-Member Islamic Military Alliance (IMA) sponsored by KSA to fight terrorism and to call back Gen Raheel Sharif, selected as head of the Alliance. The Same old logic of Iran’s sensibilities and misplaced danger of Shia-Sunni rift in Pakistan is being put forward. Recently concluded Arab-Islamic-US Summit in Riyadh gave strength to these lobbies to state that their fears that the IMA was Iran-specific have come true after the vitriolic speeches made by Trump and King Salman. They upped the ante by painting a very dark picture with ominous ramifications for Pakistan. Pressure has been intensified to force the government to opt out of the Alliance, not realizing that such a step would fulfill the dream of India to isolate Pakistan. We have seen how KSA and its close allies have offensively reacted against Qatar, and it can treat Pakistan in a similar manner. It must not be forgotten that KSA has always come to the rescue of Pakistan in its testing times, and has always been sympathetic towards Pakistan regardless of which political party or military ruler has been in power. It has taken pride in Pakistan’s armed forces and nuclear capability and has never threatened Pakistan. Same is not true for Iran. Gone are the days of Reza Shah Pahlavi. Attitudes in Iran have changed since the arrival of Ayatollahs and their officials have adopted an arrogant posture. Under what pretext and logic the Iranian lobbies in Pakistan lobbied to stop Pakistan from dispatching troops to KSA when it was threatened by Iran supported Huthis? What moral right Iran has to militarily support Huthis in Yemen? In what way we were pitching ourselves against Iran? Pakistani troops would not have jumped into the cauldron of Yemen war but at best would have deployed a division size force along the Saudi-Yemeni border to defend the integrity of KSA. Has Pakistan not been sending troops in the past to KSA for training purposes and for the defense of Khana Kaaba, and when KSA was threatened by Iraq in 1991? Once our myopic leaders opted to annoy KSA and the other Gulf States to please Iran, how did Iran reciprocate our gesture of staying out of Yemen war? Soon after, Iran stood with India and Afghanistan and signed Chahbahar agreement. Iran will never annoy India to please Pakistan but will annoy Pakistan to please India as was evident from Iran Army chief’s threat to Pakistan last May. It is closer to India and Northern Alliance ruled Afghanistan than with Pakistan. This very lobby which is in a small minority but has also influenced many veterans has been consistently tarnishing the image of former COAS Gen Raheel Sharif with the sole purpose of forcing him to resign or compelling Pak government to call him back from Riyadh. It has been repeatedly stressed by the government that the IMA headed by Gen Raheel is directed against terrorism and is not against Iran or any other country and that whenever it transgresses its mandate, Pakistan will detach itself. But the lobbies are unprepared to buy it since they are solely worried about Iran’s interest and not of Pakistan and its armed forces and keep playing sectarian card. One may ask as to why they drum up proxy wars of KSA and not of Iran. Why do they want the IMA to fight Al-Qaeda, Daesh, and Taliban and to spare Iran’s proxies? KSA and not Iran is vulnerable to threats from proxies as well as from Iran-Iraq-Syria-Yemen-Hezbollah nexus. Pakistan is faced with foreign funded proxies and Hybrid War. India wants to teach Pakistan a lesson. Afghanistan has become a hostile country. Indo-US-Afghan nexus has not changed its dangerous agenda against Pakistan. Iran is not friendly. Another storm stimulated by USA and Israel is building up in the already turbulent the Middle East as a result of heightened Iran-Saudi hostility and KSA-Qatar confrontation, which is giving shape to new alignments. Pakistan cannot remain unconcerned by these hazardous developments and its diplomacy is under test. Pakistan cannot afford to take sides and it will be its diplomatic success if it manages to stay neutral and act as a moderator to defuse KSA-Qatar tension and scale down KSA-Iran animosity. It is, however, most unfortunate that our power hungry politicians backed by paid media are oblivious of the precarious geopolitical environments and are wholly interested in snatching power by hook or crook. Devoid of political power, they first provoked the Army to boot out NS and are now expectantly looking towards the Supreme Court to disqualify him whether he is an offender or not. Like PTI, PPP has also begun to flex its political muscles and is somehow very hopeful that it will regain power in the Centre and in all provinces. A lot has been said and speculated on about the “real” objectives of Trump’s visit to Saudi Arabia. Seasoned veteran British journalist/analyst and Middle East expert Robert Fisk sees it as an attempt to create a Sunni-style NATO to curb the Iranian expansion, and his speculation is on the money, but in realistic terms, what can this visit and its “aftermath” achieve? Despite the slump on crude oil prices over the last 2-3 years, the Saudis are not short on cash, despite the huge and growing deficit they are running. Their reserve cash is estimated to be a whopping three quarters of a trillion American dollars, and the unit “trillion” has been chosen here because it is the millions of the 21st Century and billions have become too small to consider. That said, the Saudis have recently pledged nearly a third of their stash on “investments” with the USA. The first allotment came in the form of an undertaking to invest over 100 billion dollars in the American housing sector less than a fortnight ago, and upon Trump’s historic Riyadh visit, the Saudis signed an excess of 100 billion dollar arms deal contract. This is a total of an excess of 200 billion American dollars to be injected into the American economy. But on the scale of trillions again, this huge figure amounts to only a mere 1% of America’s staggering official 20 trillion dollar debt. A drop in the ocean perhaps if taken into the context of the American economy and debt, but there is little doubt that this Saudi money will create jobs in the USA, and if President Trump is still sticking by the promise of creating jobs, he’s on the money with this one too. Thus far, and nearly four months after his inauguration, it can safely be said that the most predictable thing about President Trump thus far has been his unpredictability. But with all of his eccentricities and swings, what was it that made him swing in favour of Al-Saud? It may not be very difficult to solve this puzzle if we look at the chain of events. Surely, the USA has a lot of strategic interests in the area, and these interests are multi-faceted. Among other things, the USA wants to protect the long-term well being of Israel, curb the influence of Russia and Iran in the region, have a share in the decision making of the “War on Syria”, and last be not least, keep a tight control on Saudi oil and cash wealth. One of Trump’s election promises was to get America’s allies to pay their way, and he was very vocal about the Saudis saying on a number of occasions that protecting Saudi Arabia was costing the USA more than it should be paying for. Those subtle “threats” sent a wave of shivers down the spines of Saudi royals, especially that they were already in deep trouble financially and also bogged down in a protracted and highly expensive war in Yemen that seems unwinnable. Given that the Saudis believed that former President Obama has let them down and did not invade Syria after the alleged East Ghouta chemical attack of August 2013, the unknown and rather unstable Trump looked like a wild card and they braced for the worst. Knowing that they are in deep trouble and need America more than ever, feeling extremely nervous about the Iran nuclear deal, the Saudis realized that the only option they have with Trump was to appease him; “but how?”, they wondered. But when they put two and two together, and listened to Trump’s statements about Saudi Arabia, the Saudis realized that they can and will appease him with money; a quarter of a trillion dollars and counting. Taking the big fat cheque book out is not a modus operandi that is alien to the Saudi psyche, because the Saudis have learned to solve their problems with money. And now, they believe that they are forging a new era of military and strategic alliance with the United States, and paying for this privilege with hard cash. What they do not know is that whilst they were dreaming big, thinking that they are on the verge of becoming a regional superpower to be reckoned with signing an alliance with America, Donald Trump was signing a business deal, a sales contract; nothing more and nothing less. The way Trump sees this is a win-win situation. If the Saudis do manage to get the upper military hand and curb the Iranians, he would have reached this zenith not only without having to fight Iran, but also whilst being paid for it. On the other hand, if the Saudis take a gamble to go to war with Iran and lose, he would have received his quarter trillion in advance. So for Saudi Arabia to win or lose, the deal makes America a quarter of a trillion dollar richer; or rather a quarter of a trillion less in debt. In reality however, what are the odds of Saudi Arabia winning an open war with Iran? Or will this war eventuate in the first place? Back to this question later on. In a part of the world that is highly volatile, supplying a huge arsenal of highly lethal weapons to a regime that is known for its atrocities, war crimes, inciting regional tension and creating conflict is pouring oil on an already raging fire. Trump’s arms deal with the Saudis probably marks one of the lowest points in America’s history. If anything, after the historic American-Iranian nuclear deal, America was in a position to play the role of an arbitrator and try to get the Saudis and the Iranians to reconcile; coerce them if needed. Instead, Trump turned his attack on Jihadi terrorism by supplying more support to the core and centre of terrorism (Saudi Arabia) and signed a huge arms deal that will only lead to further and much deadlier escalations. With seemingly very powerful Sunni/Shiite animosities resurfacing after many centuries of dormancy, the pro-American axis happens to be predominantly Sunni and the pro-Russian resistance axis is seen to be Shiite; though it is not as such in reality. That said, the strongest Sunni army in the region is undoubtedly Turkey’s, and Turkey could potentially play a key role in bolstering Fisk’s Sunni-”NATO”. However, the Kurdish issue is a bigger threat to Turkey than Iran has ever been, and Turkey will walk away from its Sunni brothers and “NATO” allies if they were to support Kurdish separatists and arm them; and the irony is that they are. Without Turkey, a Sunni-”NATO” will be a toothless tiger, unless perhaps it receives enough support from Israel; a support America will not be prepared to offer. But apart from some possible airstrikes and intelligence sharing, how much support will Israel give if any at all? And how much will Putin will be able to weigh in with his clout to keep Netanyahu’s nose out of it? Last but not least, how will the leaders of a so-called Sunni-”NATO” be able to “sell” the idea of getting into an alliance with Israel with its Sunni populace base? There is little doubt that the Saudis now feel that Trump has given them a carte blanche to attack Iran, and if they swallow the bait fully, they may be foolish enough to take the gamble. But first, they have to finish off Yemen, and then look back and think how they miscalculated when they planned the so-called “Operation Decisive Storm”, and which was meant to be a swift and successful operation. More than two years later, victory seems further than ever predicted all the while the Yemenis have been improving their missile manufacturing capabilities and have been able to hit targets in the capital Riyadh. The Saudis will not only have to re-evaluate the short-sighted military gamble they took in Yemen, but also the financial one. No one knows for certain what has thus far been the dollar cost that the Saudis had to cough up, but it is in the tens of billions of dollars. 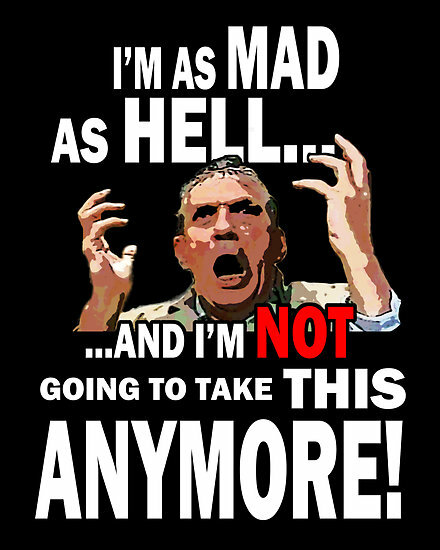 With a country that is currently running a near 90 billion dollar budget deficit and diminishing returns, to gamble one third of the national savings on a new war aimed at Iran is tantamount to both, military and financial suicide. If a war against Iran is at all winnable by the Saudis, what will be the dollar cost? If the budget ceiling was broken, just like that of Operation Decisive Storm, and if the Saudis realize that the over 100 billion odd dollars they “invested” to buy state-of-the-art weaponry from the USA was not enough, by how much will they be prepared to lift the cost ceiling? They will only need to break the ceiling 3-4 fold before they actually run out of cash reserves. Such a budget overblow is not unusual in wars, and Yemen and Syria are living proof for the Saudis to learn from; if they are capable of learning. A war against Iran will perhaps be Al-Saud’s final gamble option, but unless the Saudi royals change their rhetoric and seek reconciliation with their Shiite neighbours, this war could well be Al-Saud’s only gamble option. But the bottom line to any military action is military pragmatism. How can the Saudis think that they can invade and subdue Iran when they haven’t been able to subdue a starved and besieged Yemen? In the unlikely event that they will be able to serve Iran with a swift “shock-and-awe” strike and achieve prompt victory, what will add to their woes is Iran’s ability to close the Strait of Hormuz and to also hit oil production areas and ports. In simple terms, the Saudi war on Yemen is expensive enough, but a war with Iran will be much more expensive, and one that will cut off Saudi life-line; its income. Do the Saudis believe that expensive imported hardware is going to give the military edge they need? “Knowing” Trump, he will likely wait till the Saudis are down on their knees begging and then extort them by hiking the price of an elusive “super weapon”, perhaps even an A-Bomb, that will tip the war in Saudi favour. But “knowing” the Saudis and Iranians, if the Saudis attack and start an all-out war on Iran, then this may indeed earn the name of decisive storm, but not on Saudi terms. Will Iran virtually walk into Saudi Arabia? Such a scenario cannot be overruled. More than likely however, America will continue to feed the fire for as long as the Saudi cow (female camel in this instance) can be milked and for as long as there is money to be had. For as long as the infamous Al-Saud are on the throne, the kingdom will continue to be run by the same old rules of arrogance that will not stop until that evil legacy is down and vanquished.